This is a perfect recipe. It's balanced so well and so authentic. Everyone that I've given this to try, loves it and immediately they know what it is. Great job!!! 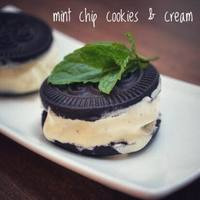 The Creme De Menthe(s) and Devon Cream work really well together in this recipe; making for a very smooth and refreshing mint flavor that I taste on the inhale and exhale. The dark chocolate & mild yeastiness of the Chocolate Deutsch marries nicely together with buttery JF Biscuit; helped along with a touch of AP. Although Chocolate Deutsch has a strong coconut flavor on it's own, I do not taste it in this recipe. Combined, these flavors make for a very tasty, well bodied, and refreshing vape. Wonderful job. I made this with the Devon cream. This flavor profile is not something I would normally look to vape but between Id10t and fresh03 continuously swearing how good this was I was curious. So I placed an order for the chocolate Deutsch, and creme de menthes. After receiving the flavors I mixed this and steeped for a week. I get a very taste Andes mint cookie. Great jod shyndo. I don't have the VT Devon cream, so I made the LA CCI version. I'm really enjoying this! The combination of biscuit and AP really boost the Chocolate Deutsch and sell me that it's an Oreo cookie. The balance between the creme de menthes and CCI work perfect here. I'll have to pick up that Devon Cream to see what that brings to the table. Good job and thanks for sharing shyndo! This is one of my top favorite flavor profiles, so I was very excited to try this out from the moment I first heard about it. I have to say, I definitely wasn't disappointed, and I will be mixing this very often and in large quantities. Everything here is balanced pretty much perfectly, and you get a pleasant chocolate bakery without any of the weird off notes commonly associated with chocolates in vaping. If this profile interests you at all, just go for it- you'll almost certainly enjoy it. The famous one shot. I got it steeping but brilliant use of the Creme de Menthe's and I can see it working now due to the fact that they are the only two worth using but different also so I'm curious if I can pick up the .2 FLV but with it being a strong flavor I bet it adds an a perfect background mint/chocolate note. There's a reason you're one of if not the very top of the food chain :-) This has given me inspiration to double down on the creme de menthe's which opens up a whole new pandoras box with so many iterations. This recipe gets five stars for getting five five star ratings in 2 days. THUMBSUP! PS It's also damn tasty. Mixed the LA CCI, FW Sweetener one-shot version since my Devon Cream has mysteriously disappeared. Right off the shake this already is such a beauty. I love the buttery cookie right on top and then the deep, creamy chocolate mint. I can't get enough of it and could drink this! Planning to save some for a little steep because I'm a cream whore and would like the cream to come out just a bit more more but not entirely sure I'll succeed at staying out of it.